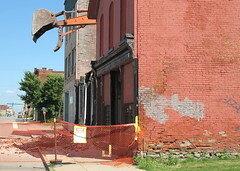 Another One - 311 Genesee, Gone. I spotted the demo crew on Genesee Street this morning. 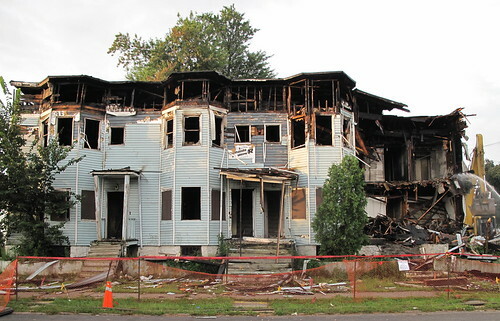 Despite a recent last minute plea by David Steele/Buffalo Rising - see The Red Mark of Death and Neighborhood in Waiting - that drew dozens of comments, 311 Genesee Street came crashing down this afternoon. 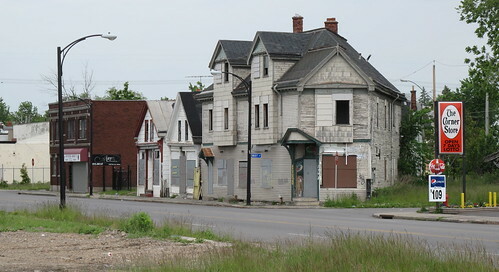 The City of Buffalo has owned this classic late 19th century mixed use building since October 2007. 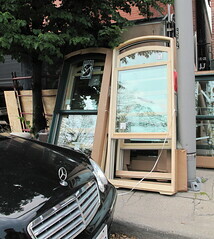 When I poked around 311 at that time - pics, here & here - it seemed to be structurally sound and straight. 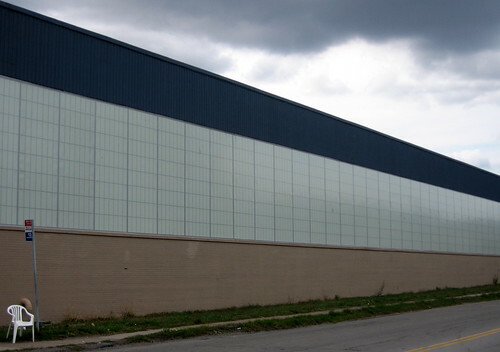 Today, without Preservation Board approval it was demolished. 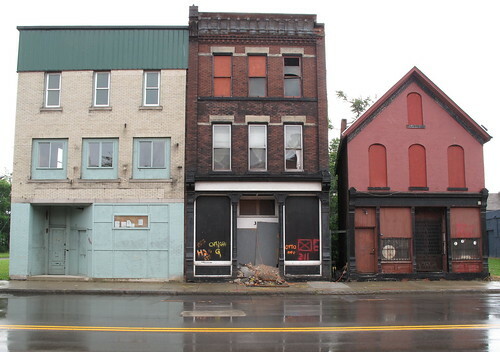 I had a moment to speak with the owner of the adjacent building, 313 Genesee. He described today's demo as bitter/sweet. 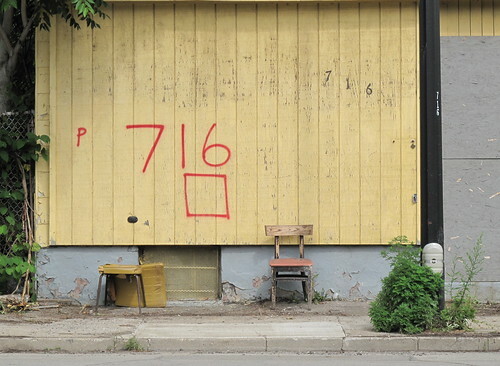 While he's developing his building into a number of artist lofts after purchasing the building from the City for a song, we talked about the wholesale lack of anything that resembles an effective marketing strategy of City owned real estate. One question that seems to be rarely asked - should it be? - is what sort of city do we want to live in? I mean who's deciding that structurally sound buildings that evoke walkable neighborhoods and multiple uses should be sent off to a landfill? If these buildings are going to be desirable in the future - where's the strategy to mothball and save them for the market to catch-up? Is demolition the best course of action? Will some homogenized bland box replace this? These have never been rhetorical questions. They go to the heart of the matter and raise a set of questions about the long term viability of these structures in helping to create the sort of city we want. It's been reported that the Preservation Board sent Mayor Brown a letter last week asking for an explanation as to why they weren't consulted on this demolition. 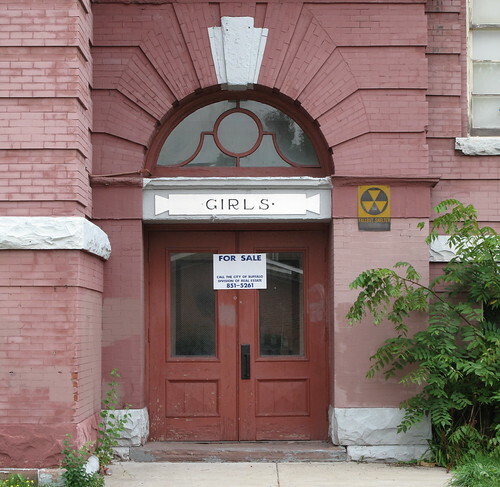 There was no immanent public health risk - ie, falling bricks or a crumbling facade. As of this afternoon they hadn't received an answer as to why money wasn't spent mothballing this classic. Here's the rest of this afternoon's pics - 311 Gone. While this blog is in a state of flux - as the primary purpose behind this blog has burned down and the debris is now buried in a landfill south of Buffalo in Chaffee, NY (see this post) - I'd like to take a moment to remind readers to act responsibly when you decide to comment on a post. While most of my posting will contain a daily pic from the City's East side, I will occasionally post about topics that are sensitive and timely - about developments that impact my neighborhood here on the City's East side and that are connected to issues that may shape policy on various levels, in this the third poorest City in the country. I've tossed the comment stream into moderation in the past - I will again. Transparency - knowing who we are engaging with - builds and shapes dialog in meaningful ways. So, if you comment here occasionally or frequently, I encourage you to use your name or an avatar you're generally known by. If you desire to remain - for whatever reason - 'anonymous' is fine. But in either case, please be responsible - site facts, sources and move the dialog forward in an informed and meaningful way. While I've rarely removed comments, going forward I will delete comments that i think are inflammatory or mean spirited on any side of a particular issue. I will then place comments in 'moderation'. If you think about this as a sandbox, build something cool. Don't throw sand. My neighbors, city residents and all the Buffaloians in diaspora that check in here on a regular basis are counting on you. Thanks. Three additional media pieces have appeared in the last 24 hours about Michael Gainer's firing from Buffalo ReUse. Artvoice has a cover blurb and this short piece in their weekly news round-up. Gainer was replaced as executive director in January by his board of directors, with which he’d had a contentious relationship. 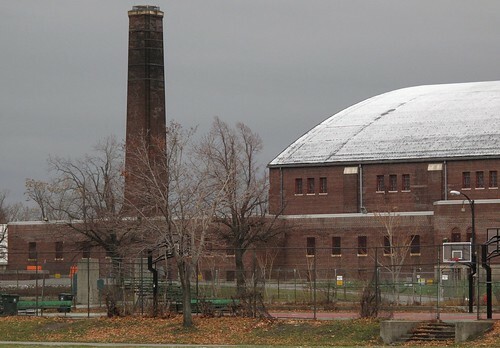 The board accused Gainer of poor financial management—a charge to which Gainer pleads guilty—while he suspected the board was more interested in bottom lines than in what he regards as the raisons d’etre for Buffalo ReUse: community development, neighborhood building, job training. Gainer was demoted to operations manager, and West Side housing activist Garrett was named ED. 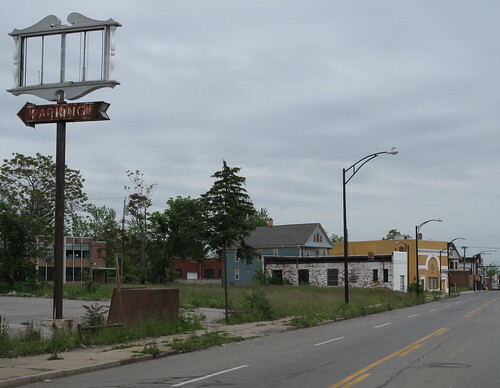 According to Garrett, Gainer continued to put Buffalo ReUse in legal and financial jeopardy, and his relationship with the board grew worse. Gainer says he felt undermined by both Garrett and the board, and that what he’d needed all along was a financial manager to put the organization’s books in order—not to be replaced. Last week, Garrett says, Gainer was put on unpaid leave, for reasons he would not divulge. On Monday, Garrett says the board told him to dismiss Gainer. Both Gainer and the board have released statements about the dismissal. Many members of the organization are furious. Many ReUse employees feel at sea. This is an interesting and fraught moment for ReUse, a young, celebrated not-for-profit; for Gainer, its dynamic but somewhat flawed founder; and for Garrett, a popular community activist with his reputation on the line. Buffalo Rising covered the story with Elena's post this morning - here. WBFO aired - Buffalo ReUse Founder Fired - this morning that includes an interview with Stephanie Simeon, the President of Buffalo ReUse's board. 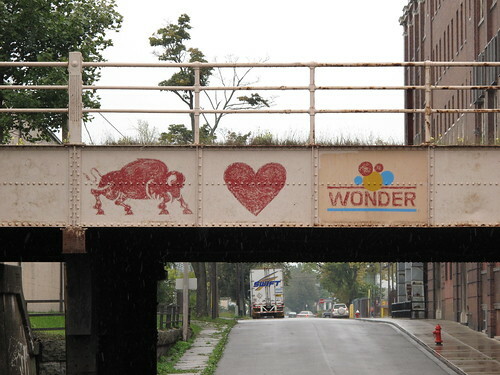 There a few links to additional Buffalo ReUse stories following that link. Carl Lee sent his video - Buffalo ReUse: Building Community - to me this morning. He shot it last year as part of a program sponsored by Squeaky Wheel. See Shooting Buffalo for more about this series and my flickr for additional pics of Buffalo, NY. I'm collecting this daily series of pics - here. Check out - The Red Mark of Death - another developing series about broken and neglected buildings. See Shooting Buffalo for more about this series and my flickr for additional pics of Buffalo, NY. I'm collecting this daily series of pics - here. Additional Buffalo grain elevators pics can be found in another series - here. Mark Sommer wrote the following article that appeared in today's Buffalo News - ReUse Founder Fired. Yesterday's Part I provides some additional background. A heralded grass-roots leader in Buffalo has been fired from the East Side nonprofit organization he founded three years ago. 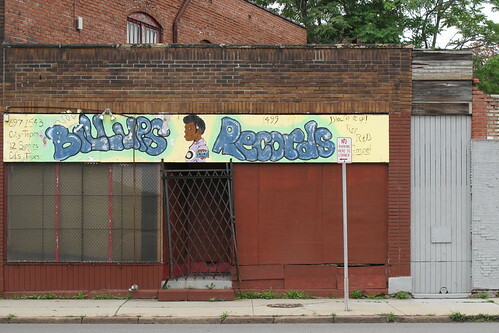 Michael Gainer was removed Monday as operations manager of Buffalo ReUse, which salvages building materials sold in its ReUse store as an alternative to demolition, to promote neighborhood development and provide jobs for inner- city youth. His relationship with Garrett as an intermediary failed, he said, due to “incompatible values, priorities and vision.” - read the rest. Make certain to check out Chris Smith's coverage of this story over at Buffalo Geek and Alan's Buffalo Pundit - Rocky Week for Buffalo Activism. Here's the latest video from WNYmedia where Michael Gainer speaks out about these developments. I just spotted this in last week's Wall Street Journal - 'Fastest Dying Cities' Meet for a Lively Talk. In a historic reversal, the cities are embracing plans that emphasize growing smaller. 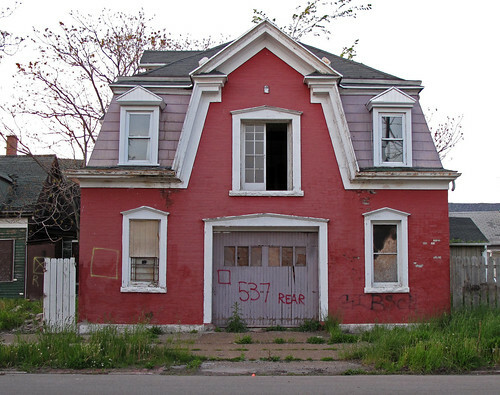 In Buffalo, where more than a third of the students drop out of high school, Michael Gainer, executive director of Buffalo ReUse, is putting young people to work dismantling some of the thousands of abandoned homes and selling the scrap materials. I've been a huge supporter of Buffalo ReUse and Michael Gainer's leadership and vision. Under Michael's leadership the organization was formed and moved to this neighborhood, around the corner on Northampton. It has become a functionally integrated and necessary component in helping shift perceptions and gradually move this neighborhood off of life-support. 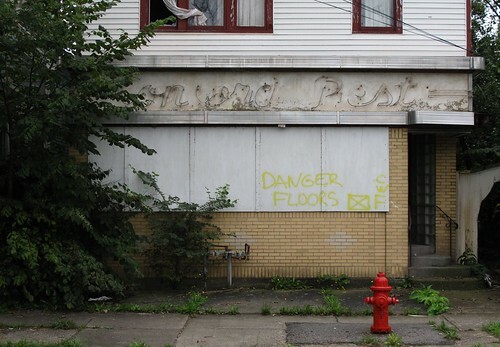 I've blogged about Buffalo ReUse with a dozen posts - google 'gainer' in this blog's search box - and see this organization and Michael's works as a unique and transformative moment in an increasingly fragmented landscape in this, the country's third poorest city. This morning I learned that Michael Gainer was fired yesterday from his position by Harvey Garrett, a west side housing activist and the newly appointed interim Executive Director of Buffalo ReUse. I spoke with Michael this morning and just met with him this afternoon. Harvey Garrett responded in an email that he'd have a statement for me this afternoon. In response to my request for an official statement from Buffalo ReUse, I received the following statement from Harvey Garrett this afternoon via email. This is the official statement so far - it's still being worked on but here it is. As no doubt you already know, Michael Gainer, one of our founding members, is no longer employed by Buffalo ReUse. Buffalo ReUse will forever be indebted to Michael for his vision, passion and drive, without which Buffalo ReUse would not exist today. The decision to part ways with Michael was the most difficult our young organization has faced, and we assure you it was absolutely our last resort. As the statement released by Michael indicates “lots” of “mistakes” were made, protocols were not followed and the chain of command was not respected. 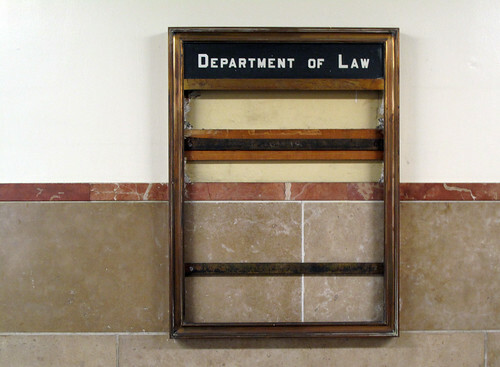 These infractions have created significant barriers to the organization, its sustainability and its future growth. Like all not for profit entities, Buffalo ReUse--and everyone associated with it--must, above all else, follow clearly defined regulations and protocol for its business matters. Unfortunately, a cross-roads has been reach with Michael regarding these matters and accordingly a change had to be made. We wish Michael the best in his future professional endeavors. If you would like further information we urge you to contact Stephanie Simeon, Chair of the Board of Directors at Stephanie.simeon@gmail.com. I'll be posting additional material and statements about this rapidly developing story as it becomes available. Make sure to check out the growing comment stream/video that Chris Smith has posted over at Buffalo Geek - here. A video interview with Michael Gainer about these developments is in the works. While figuring out what to do next with my blog - as the primary reason for blogging about the City has now literally been sent to a landfill, here - I'll be posting a daily pic of the City. I carry a p/s camera with me all the time and have been inspired recently by Capturing the City - a very cool photo essay - that appeared in the New York Times the other day. Sean from one of the continent's most amazing photo collectives - Toronto's DK Photo Group - turned me on to the Big Picture from the Boston Globe. I dip into that on a regular basis for additional perspectives. I'll be collecting these daily shots in my flickr stream and will add a slide shows and videos of the City along the way. 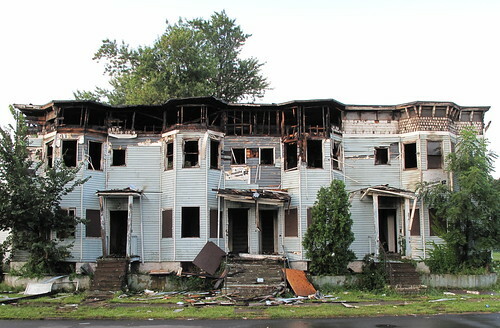 So, before the summer comes to an end I'll have a post-mortem on the Woodlawn Row Houses, or not. 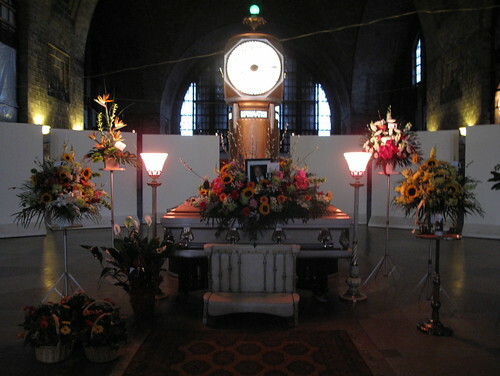 Russell Pawlak's wake was tonight in the Central Terminal's main concourse. Russ was an inspiration and an amazing influence. He understood the East Side's past, present and helped all of us understand the importance of preserving the Central Terminal. 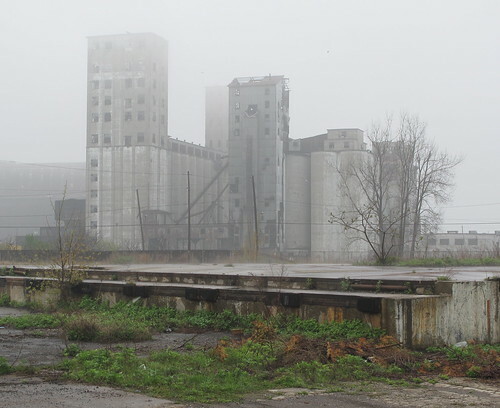 When the City owned Wollenberg Grain Elevator was torched and demolished, I called Russ. He opened the terminal to the industrial remains of City's last wooden grain elevator for safe storage. When a photographer wanted access, he made sure the terminal's door was open. Lunch and dinner with Russ always included his take on the importance of certain gallery openings in NYC or a lecture or show he'd attended here or somewhere in Europe - all woven into a story about the importance and role of art, aesthetics, history and philosophy in our lives. Mark Sommer wrote Russ's obituary for the Buffalo News, here and a few more pics from tonight. Russ will be missed. His legacy remains - Buffalo's best loved building. 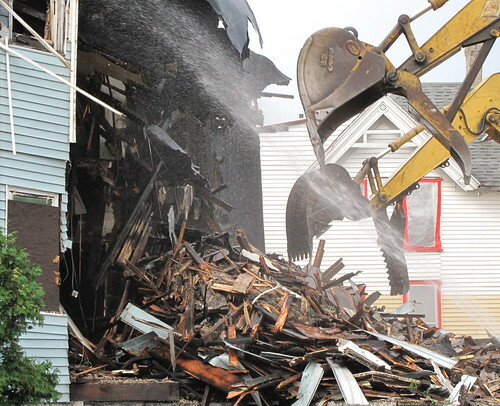 The Woodlawn Row Houses were demolished this morning. 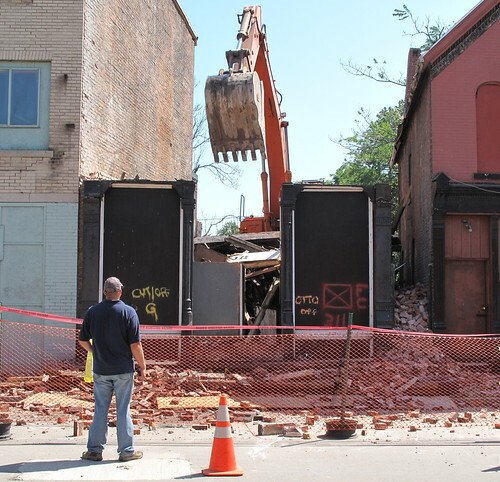 Here's a slide show of this morning's demolition and a short video. Wreckers showed up late yesterday and beginning at 6:30 this morning crews quickly reduced this local mark to a pile of rubble in less than 90 minutes. 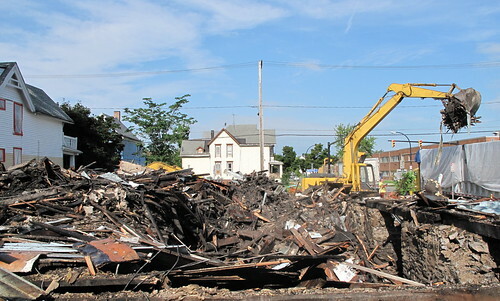 I spoke with Al Steel from Hannah Demoltion this morning. His company won the $36k emergency demolition contract. He expects the 8-10 trucks loads of debris, headed to a landfill in Chaffee, NY to be removed from the site by late afternoon. Despite the signs, Al told me that there was no asbestos present. Buffalo News reporter Jim Heaney's front page story is here. Make sure to check out his post - More of our History goes up in Smoke! I spoke with a couple firemen who were there dowsing the charred remains at 7am. 75% of the roof was burned and the view from above goes direct to the basement. The cause, arson. 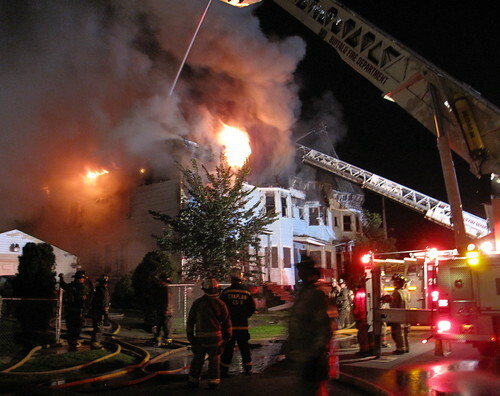 An accelerant was most likely used and fed the nightmares of neighbors whose well kept homes were always in the proximal path of another fire in the City's increasingly larger vacant housing stock. Fortunately everyone was wakened and no one was hurt on Woodlawn this morning. The fire wrecked any realistic hope of ever saving one of the last sets of row houses here in the Queen City. Designated by the City's Preservation Board with local land mark status in 1982, the Woodlawn Row Houses were architecturally and historically unique. Here's the archive. 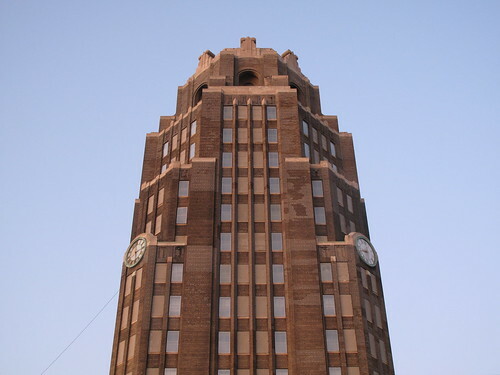 fixBuffalo readers may remember the other historic - local landmark and National Register - property, The Wollenberg Grain Elevator. 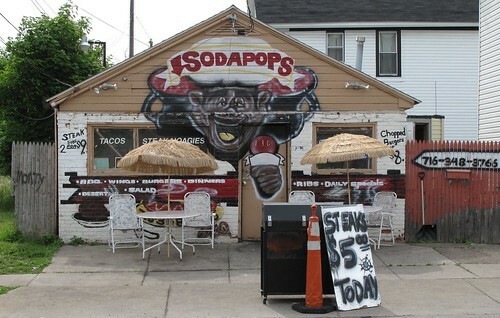 It was owned by the City and never maintained or properly sealed. It burned three years ago. It was the last remaining wooden grain elevator - the forerunner of Concrete Atlantis - and an integral part of our city's historic and industrial past. 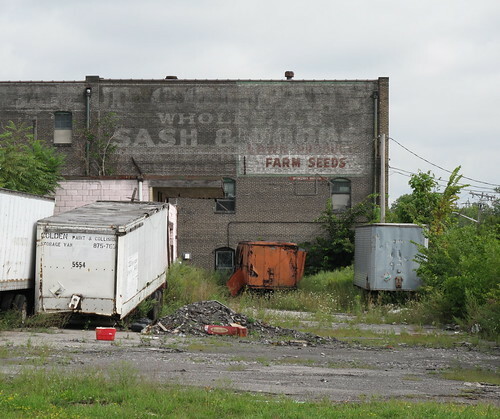 It was never marketed by the Division of Real Estate and clearly could have been part of the City's resurgence, similar to the Waasaic Project. 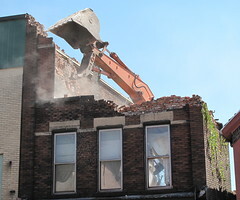 An emergency demolition is the most likely scenario for what remains. 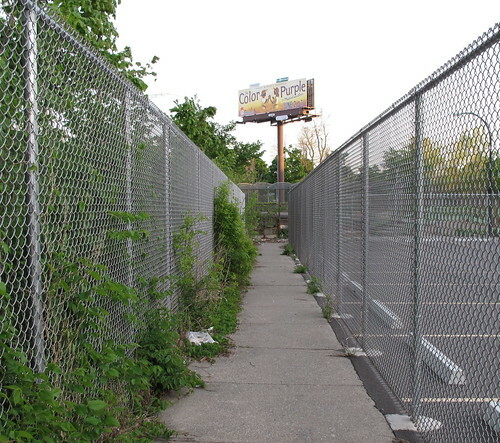 The path to the City's Division of Real Estate is well worn. Responsibility lies there. Accountability doesn't. Why? 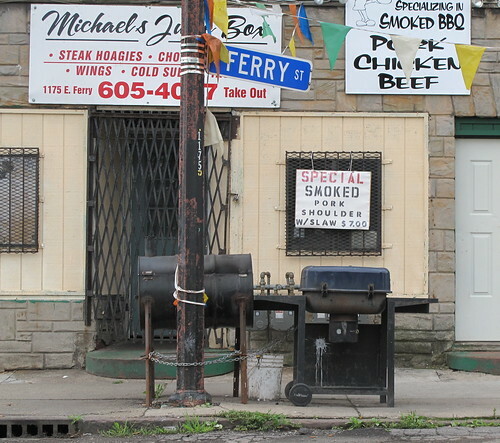 See flickr slide show - Burning Woodlawn! 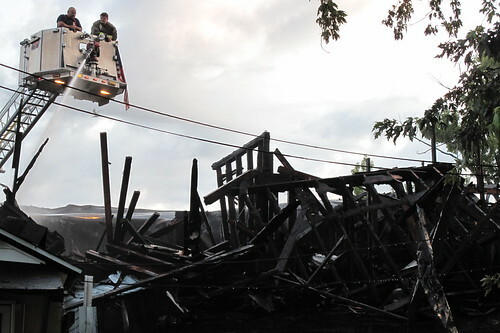 Flickr slide show of this morning's wreckage on Woodlawn Avenue. On my way home this morning I noticed the smoke belching from the top floor. I called 911 at 3:09 and the first fire truck arrived 3 minutes later. 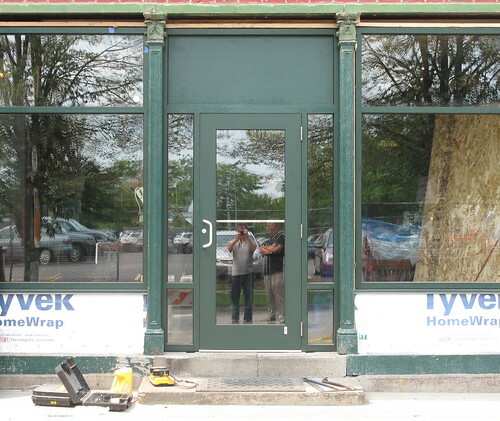 Jim Daley was outside this afternoon watching the exterior renovations here at Ulrich's. 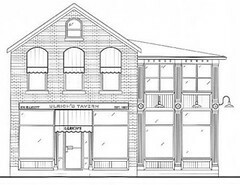 He's carefully planned a number of significant facade improvements at one of Buffalo's best loved food/drink spots and the City's oldest continuously run tavern. If you're not from Buffalo and are considering passing through the Queen City or staying longer you'll want to stop and eat/drink here at Ulrich's. Please don't let restaurant and food reviews such as this one - Bon appetit! America's Top Restaurant Cities - (see second paragraph) sour you on Queen City Cuisine. Check out this riotous short video featuring Nelson Starr on food and Buffalo, filmed by John Paget for your guide to what's authentic and so Buffalo. After seeing Nelson and John's video, Anthony Bourdain stopped by for a 'No Reservations' segment a few months back. Here's the architect's rendering of what we can expect in a few days and a close-up of the custom fenestration that will be installed on the building's second floor. The sketch is adapted from a 1927 picture of Ulrich's that Jim has been looking at for years. Make sure to check out Ulrich's for additional development news. Jim expects the renovations to be complete by the week's end. I'll be back with friends for beers on Friday night to check out the some of the interior renovations Jim is completing. 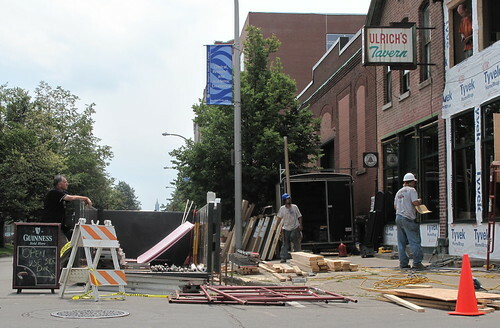 In addition to the facade and interior renovations here at Ulrich's there a number of additional developments and projects unfolding here along Ellicott Street. More about the City's newest park, next week.